DVD and Blu-ray movies are the main entertainment for most people, especially when you don't like to go outside, one perfect DVD or Blu-ray movie can help you to spend a nice weekend. When you get the multiple DVD and Blu-ray discs, you may find some troubles: You can't find one favourite DVD and Blu-ray disc quickly, some DVD and Blu-ray discs are unwatchable due to the frequent playback or dust. So convert Blu-ray/DVD to H.265/HEVC MKV is becoming the hot topic for most users. Why convert Blu-ray/DVD to H.265/HEVC MKV? Keep reading. As known to all, compared to digital media file formats, Blu-ray/DVD disc usually has additional subtitle languages and audio tracks. 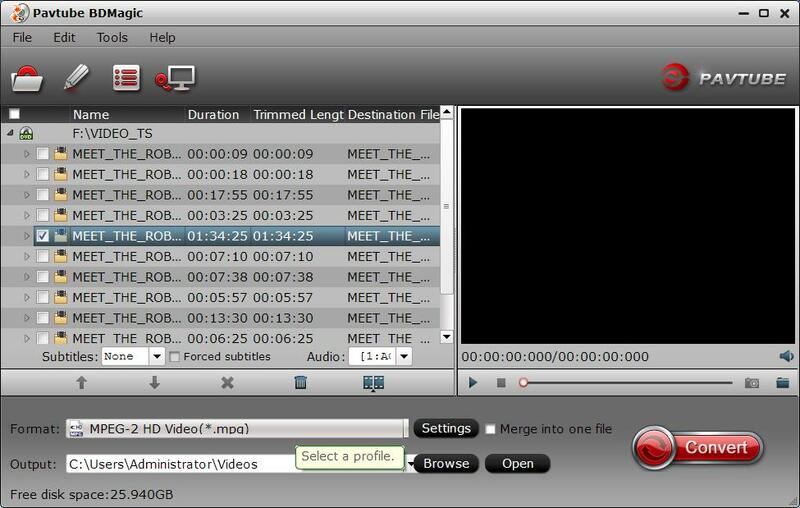 The subtitle printed on the movies can help users to understand the movie better and audio tracks can be used for broadcasting. 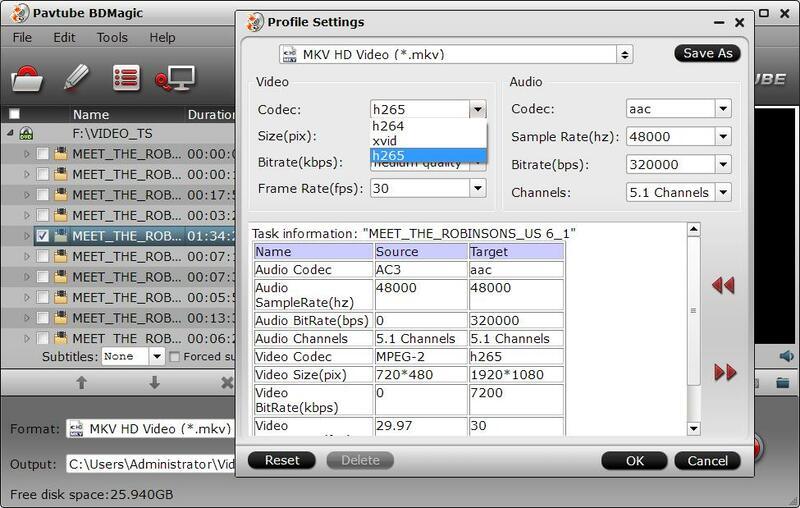 If you compress your Blu-ray/DVD to H.265 MP4 or other file container formats, all the subtitles and audio tracks will be lost, but the MKV format has the capability to hold the subtitle languages, audio tracks as well as other multimedia content such as video, audio files, menus, chapter structure, etc. Not all the DVD and Blu-ray ripper can convert the DVD and Blu-ray to multi-track MKV video, like the Handbrake, which is a open DVD ripper, free and easy to use, but you can't get the MKV video formats with subtitle languages, audio tracks. You can can try Pavtube BDMagic which is a professional DVD ripper and can remove the DVD and Blu-ray copy protection, like the CSS, RC, RCE, APS, UOPs, AACS, BD+, RC, BD-Live, etc. You not only can load the DVD and Blu-ray disc to it, also cna import the DVD and Blu-ray disc images, folder to it. For Mac users, you can get Mac version. When you load the DVD and Blu-ray disc, you can get H.265/HEVC encoded HD MKV from Blu-ray/DVD, which not only saves the storage space but also for playing on H.265 compatible multimedia players like VLC, Divx, PotPlayer, Hoid P HEVC H265 Video Player, PowerDVD 14 Ultra, etc with rich media experience. In addition, you can keep the subtitles, chapters, audio tracks you want or remove some of them you don't like. 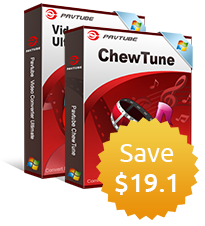 Benefit: Pavtube BDMagic and other Windows Pavtube software has upgraded to version 4.9.0.0 with support for H.265/HEVC encoding acceleration on a PC that running Nvidia GPU with either Maxwell (GM206) or Pascal technology enabled graphic cards. You just need to adjust the video codec to H.265 or H.264 codec, you can experience the 30x faster speed than common DVD and Blu-ray ripper. How to transcode Blu-ray/DVD to H.265 HEVC HD MKV? Step 1. Load Blu-ray or DVD disc. Click "File" menu, "Load from disc" to add Blu-ray or DVD from optical drive, when both Blu-ray or DVD exists, the software will load DVD. You can drag the DVD and Blu-ray disc to this software directly. When you load the DVD/Blu-ray disc, this software will detect the main title autmatically. You can click "Subtitle" and "Audio" drop-down box under the file displaying panel to select your preferred subtitle language and audio track. By the way, there are other 300+ video formats are here, you can choose one you want for playing DVD and Blu-ray disc on other device or media player, like iPad, iPhone, PS4, Xbox one, VLC, WMP, TVs, etc. Even you are a PC beginner, you can choose the device preset quickly. Even you can get the 3D video from the common DVD and Blu-ray disc. If you have one 4K TV at home, you can get the 4K video too. This Blu-ray ripper provides you the best video setting, you can adjust the video resolution for getting 4K video file and play on 4K TV, for example: Output file resolution to 3840*2160 from "Size(pix)" in the "Profile Settings" window. 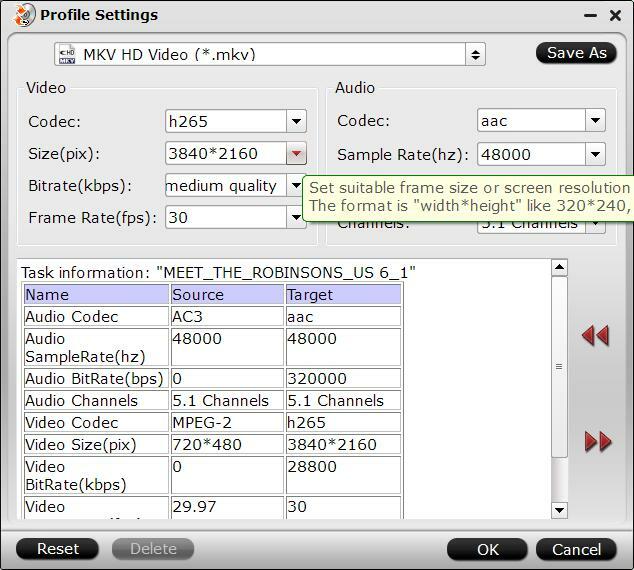 You also can adjust the video and audio codes, video frame, video bitrate, audio channels, etc. Step 3: Convert Blu-ray/DVD to H.265 encoded HD MKV format. Hit the "Convert" icon on the right-bottom to start the conversion process. Get ripped Blu-ray/DVD files by clicking the "Open output folder" button. Then you will be able to save all your precious Blu-ray/DVD movies with subtitle languages and audio tracks well reserved for playing on various H.265 capable players with rich media experience. We made the video and help you to master above skills quickly. Hope you can get the desired video file from the DVD and Blu-ray discs.